COUNTLESS others have had their say but yesterday it was Scott Allan himself who dismissed talk of him leaving Hibernian, saying he expects to see out the new campaign with the Easter Road club. Last season’s Championship Player of the Year, who has a year left on his contract, has been the focus of unrelenting transfer speculation, with Rangers expressing a strong interest, while champions Celtic are also reported to be considering a bid. 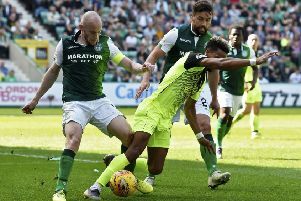 But, reporting back for the first day of pre-season training at the club’s East Mains complex, the 23-year-old, who is under contract until next summer, said he had not had his head turned by the constant rumours and intends to remain at Hibs. Admitting his aim is to one day return to England, where he feels he has unfinished business after an unfulfilling move to West Bromwich Albion and loans spells at Birmingham City, MK Dons and Portsmouth, the midfielder said his immediate focus is on helping the Leith side back to the Scottish top flight. Hibs head coach Alan Stubbs has revealed that no formal overtures have been made and made it clear that he would rather hold on to the influential player and risk losing him for nothing in 12 months than sell him now, especially to a title rival. And while Celtic have been keeping tabs on the situation and Dundee United had a January transfer bid rejected, Rangers remain favourites to lodge a bid before the trasnfer window closes. They were unsuccessful in the past and Stubbs has suggested that it would take a transfer fee in the region of £3 million for Hibs to consider a rethink but Rangers vice-chairman Paul Murray has made it known that he is a firm fan of the Scot. “He’s obviously under contract with someone else so we can’t talk about him in too much detail,” he said in a newspaper interview, “but we should be seeking to identify players who can add value to our team and our squad and bring them in and add further value to them through what we do here. It’s like manufacturing where you take the raw material in, add value to it, and get a finished product.